Auburn University (AU or Auburn) is a public research university located in Auburn, Alabama, United States. With more than 22,000 undergraduate students and a total of more than 28,000 students and 1,200 faculty members, it is one of the largest universities in the state  as well as one of two public flagship universities in the state. 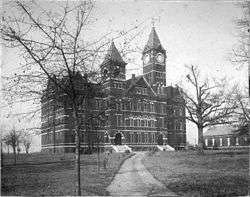 Auburn was chartered on February 1, 1856 as East Alabama Male College, a private liberal arts school affiliated with the Methodist Episcopal Church, South. 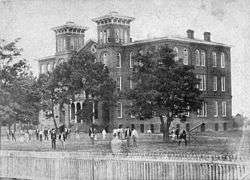 In 1872, under the Morrill Act, it became the state's first public land-grant university and was renamed as the Agricultural and Mechanical College of Alabama. In 1892, it became the first four-year coeducational school in Alabama. In 1960, its name was officially changed to Auburn University to acknowledge the varied academic programs and larger curriculum of a major university. In 1964, under Federal Court mandate AU admitted its first African American student. Auburn is among the few American universities designated as a land-grant, sea-grant, and space-grant research center. Auburn University was chartered by the Alabama Legislature as the East Alabama Male College on February 1, 1856, coming under the guidance of the Methodist Church in 1859. The first president of the institution was Reverend William J. Sasnett, and the school opened its doors in 1859 to a student body of eighty and a faculty of ten. The early history of Auburn is inextricably linked with the Civil War and the Reconstruction-era South. Classes were held in "Old Main" until the college was closed due to the Civil War, when most of the students and faculty left to enlist. The campus was used as a training ground for the Confederate Army, and "Old Main" served as a hospital for Confederate wounded. To commemorate Auburn's contribution to the Civil War, a cannon lathe used for the manufacture of cannons for the Confederate Army and recovered from Selma, Alabama, was presented to Auburn in 1952 by brothers of Delta Chapter of the Alpha Phi Omega fraternity. It sits today on the lawn next to Samford Hall. The school was reopened in 1866 following the end of the Civil War and has been open ever since. In 1872, control of the institution was transferred from the Methodist Church to the State of Alabama for financial reasons. Alabama placed the school under the provisions of the Morrill Act as a land-grant institution, the first in the South to be established separate from the state university. This act provided for 240,000 acres (971 km²) of Federal land to be sold in order to provide funds for an agricultural and mechanical school. As a result, in 1872 the school was renamed the Agricultural and Mechanical College of Alabama. Under the provisions of this act, land-grant institutions were also supposed to teach military tactics and train officers for the United States military. In the late 19th century, most students at the Agricultural and Mechanical College of Alabama were enrolled in the cadet program, learning military tactics and training to become future officers. Each county in the state was allowed to nominate two cadets to attend the college free of charge. The curriculum at the university originally focused on engineering and agriculture. This trend changed under the guidance of William Leroy Broun, who taught classics and sciences and believed both disciplines were important in the overall growth of the university and the individual. In 1892, two historic events occurred: women were first admitted to the Agricultural and Mechanical College of Alabama, and football was first played as a school sport. Eventually, football replaced polo as the main sport on campus. The college was renamed the Alabama Polytechnic Institute (API) in 1899, largely because of Broun's influence. On October 1, 1918, nearly all of Alabama Polytechnic Institute's able-bodied male students 18 or older voluntarily joined the United States Army for short-lived military careers on campus. The student-soldiers numbered 878, according to API President Charles Thach, and formed the academic section of the Student Army Training Corps. The vocational section was composed of enlisted men sent to Auburn for training in radio and mechanics. The students received honorable discharges two months later following the Armistice that ended World War I. API struggled through the Great Depression, having scrapped an extensive expansion program by then-President Bradford Knapp. Faculty salaries were cut drastically, and enrollment decreased along with State appropriations to the college. By the end of the 1930s, Auburn had essentially recovered, but then faced new conditions caused by World War II. As war approached in 1940, there was a great shortage of engineers and scientists needed for the defense industries. The U.S. Office of Education asked all American engineering schools to join in a "crash" program to produce what was often called "instant engineers." API became an early participant in an activity that eventually became Engineering, Science, and Management War Training (ESMWT). Fully funded by the government and coordinated by Auburn's Dean of Engineering, college-level courses were given in concentrated, mainly evening classes at sites across Alabama. Taken by thousands of adults – including many women – these courses were highly beneficial in filling the wartime ranks of civilian engineers, chemists, and other technical professionals. The ESMWT also benefited API by providing employment for faculty members when the student body was significantly diminished by the draft and patriotic volunteers. During the war, API also trained U.S. military personnel on campus; between 1941 and 1945, Auburn produced over 32,000 troops for the war effort. Following the end of World War II, API, like many colleges around the country, experienced a period of massive growth caused by returning military personnel taking advantage of their GI Bill offer of free education. In the five-year period following the end of the war, enrollment at API more than doubled. Recognizing the school had moved beyond its agricultural and mechanical roots, it was granted university status by the Alabama Legislature in 1960 and officially renamed Auburn University, a name that better expressed the varied academic programs and expanded curriculum that the school had been offering for years. However, it had been popularly called "Auburn" for many years even before the official name change. Auburn University was racially segregated prior to 1963, with only white students being admitted. Integration began in 1964 with the admittance of the first African-American student, Harold A. Franklin. The first degree granted to an African-American was in 1967. According to Auburn University's Office of Institutional Research and Assessment, African-Americans comprise 1,828 of the university's 24,864 undergraduates (7.35%) as of 2013 and 49 of the 1,192 full-time faculty (4.1%) as of 2012. AU has decreased its African American faculty percentage from 4.3% in 2003 to 4.1% today, since the settlement of legal challenges to the underrepresentation of African Americans in AU's faculty in 2006. Today, Auburn has grown since its founding to have an on-campus enrollment of over 25,000 students and a faculty of almost 1,200 at the main campus in Auburn. There are also more than 6,000 students at the Auburn University at Montgomery satellite campus established in 1967. Auburn has traditionally been rated highly by academic ranking services, and has been listed as one of the top 50 public universities for 20 consecutive years. The 2014 edition of U.S. News & World Report ranks Auburn as the 103rd university in the nation among public and private schools and 48th among public universities. Auburn was the only college or university in Alabama included in the inaugural edition (1981) of the widely respected Peterson's Guides to America's 296 Most Competitive Colleges. 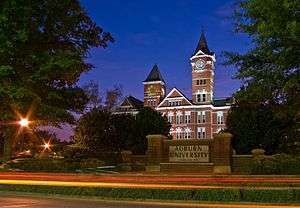 Furthermore, the 1995 edition of "The Guide to 101 of the Best Values in America's Colleges and Universities" listed Auburn in the prestigious "National Flagship University" category. Auburn is a charter member of the Southeastern Conference (SEC), currently composed of 13 of the largest Southern public universities in the U.S. and one private university, Vanderbilt. Among the other 12 peer public universities, Auburn is ranked fourth in the 2011 edition of U.S. News & World Report. This high ranking and reputation for academic quality is in spite of the fact that Auburn's $378.6 million endowment is currently the second smallest of the 13 SEC universities. An attempt to increase the endowment by $500 million began in 2005 with the "It Begins at Auburn" campaign. As of August 2006, the campaign had raised $523 million, making it the largest campaign in university history. The university currently consists of thirteen schools and colleges. Programs in architecture, pharmacy, veterinary science, engineering, forestry, and business have been ranked among the best in the country. The journal DesignIntelligence in its 2013 edition of "America's Best Architecture and Design Schools" ranked Auburn's undergraduate Architecture program No. 9 and Industrial Design program No. 6 nationally. In addition, Auburn's graduate Landscape Architecture program was ranked No. 13 nationally and Industrial Design program 4th. The undergraduate Interior Design program in the College of Human Sciences is ranked No. 1 nationally by DesignIntelligence magazine. For its annual survey, "America's Best Architecture & Design Schools," the publication asked 277 leading architecture and design firms which schools best prepare students for success in the profession. Based on Interior Design programs accredited by the Council for Interior Design Accreditation (CIDA), Auburn was ranked No. 1 in the nation, along with Savannah College of Art and Design. Auburn's College of Architecture pioneered the nation's first interior architecture degree program; its dual degree Architecture & Interior Architecture degree was the first in the nation. Its College of Architecture, Design, and Construction pioneered the nation's first Design Build master's degree program, capitalizing on the College's Building Science program with Auburn's "Rural Studio" program where Architectural students build highly creative and ingenious homes for some of the poorest regions of Alabama. These homes and efforts have been publicized by People Magazine, Time, featured on The Oprah Winfrey Show, numerous Architectural and Construction periodicals as well. Of special mention is the School's Rural Studio program, founded by the late Samuel Mockbee. The Samuel Ginn College of Engineering has a 134-year tradition of engineering education, consistently ranking in the nation's largest 20 engineering programs in terms of numbers of engineers graduating annually. The college has a combined enrollment of close to 4,000. Auburn's College of Engineering offers majors in civil, mechanical, electrical, industrial and systems engineering, polymer and fiber engineering, aerospace, agricultural, bio-systems, materials, chemical engineering, computer science, and software engineering, and—more recently—began a program in wireless engineering after receiving a donation from alumnus Samuel L. Ginn. In 2001, Ginn, a noted U.S. pioneer in wireless communication, made a $25 million gift to the college and announced plans to spearhead an additional $150 million in support. This gave Auburn the first Bachelor of Wireless Engineering degree program in the United States. 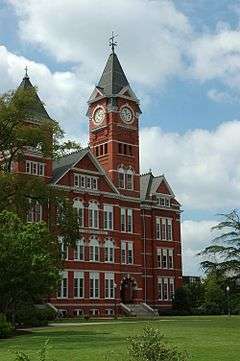 Auburn University was the first university in the Southeast to offer the bachelor of software engineering degree and the master of software engineering degree. Auburn has historically placed much of its emphasis on the education of engineers at the undergraduate level, and in recent years has been ranked as high as the 10th largest undergraduate engineering program in the U.S. in terms of the number of undergraduate degrees awarded on annual basis. The Ginn College of Engineering is now focused on expanding the graduate programs, and was recently ranked 60th nationally university with doctoral programs in engineering by U.S. News & World Report. Last year, the College ranked 67th among all engineering programs . "America's Best Graduate Schools 2006" ranks the Ginn College of Engineering's graduate program in the Top 100 graduate engineering programs in the U.S. Auburn's Industrial and Systems Engineering, Civil Engineering, Chemical Engineering, and Mechanical Engineering were all ranked in the top 100. Auburn's Economics Department (formerly in the College of Business, now in the College of Liberal Arts) was ranked 123rd in the world in 1999 by the Journal of Applied Econometrics. Auburn was rated ahead of such international powerhouses as INSEAD in France (141st) and the London Business School (146th). Auburn's MBA Program in the College of Business has annually been ranked by U.S. News & World Report magazine in the top ten percent of the nation's more than 750 MBA Programs. The Ludwig von Mises Institute offices were once located in the business department of Auburn University, and the LvMI continues to work with the university on many levels. Nationally recognized ROTC programs are available in three branches of service: Air Force, Army, and Navy/Marine Corps, the latter being the only one in Alabama. Each of these units is ranked among the top ten in the nation. Over 100 officers that attended Auburn have reached flag rank (general or admiral), including one, Carl Epting Mundy Jr., who served as Commandant of the U.S. Marine Corps. Auburn is one of only seven universities in the Nuclear Enlisted Commissioning Program, and has historically been one of the top ROTC producers of Navy nuclear submarine officers. In addition to the many outstanding ROTC graduates commissioned through Auburn, two master's degree alumni from Auburn, four-star generals Hugh Shelton and Richard Myers, served as Chairman of the Joint Chiefs of Staff in the last decade. Both officers received their commissions elsewhere, and attended Auburn for an M.S. (Shelton) and M.B.A. (Myers). Auburn has graduated six astronauts (including T.K. Mattingly of Apollo 13 fame) and one current and one former director of the Kennedy Space Center. 1972 Auburn Mechanical Engineering graduate Jim Kennedy, currently director of NASA's Kennedy Space Center, was previously deputy director of NASA's Marshall Space Flight Center (MSFC). Several hundred Auburn graduates, primarily engineers and scientists, currently work directly for NASA or NASA contractors. Hundreds of Auburn engineers worked for NASA at MSFC during the peak years of the "space race" in the 1960s, when the Saturn and Apollo moon programs were in full development. 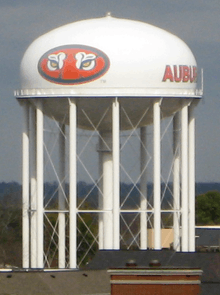 Auburn University owns and operates the 423-acre (1.71 km2) Auburn University Regional Airport, providing flight education and fuel, maintenance, and airplane storage. The Auburn University Aviation Department is fully certified by the FAA as an Air Agency with examining authority for private, commercial, instrument, and multiengine courses. In April 2015, Auburn University received the nation's first FAA approval to operate a new Unmanned Aircraft Systems Flight School as part of the Auburn University Aviation Center. The College of Business's Department of Aviation Management and Supply Chain Management is the only program in the country to hold dual accreditation by the Association to Advance Collegiate Schools of Business (AACSB) and the Aviation Accreditation Board International (AABI). Created over 65 years ago, Auburn's flight program is also the second oldest university flight program in the United States. The Old Rotation on campus is the oldest continuous agricultural experiment in the Southeast, and third oldest in the United States, dating from 1896. In addition, the work of Dr. David Bransby on the use of switchgrass as a biofuel was the source of its mention in the 2006 State of the Union Address. The university recently began a Master of Real Estate Development program., one of the few in the Southeast. The program has filled a void of professional real estate education in Alabama. Modern Healthcare ranked Auburn University's Physicians Executive M.B.A. (PEMBA) program in the College of Business ninth in the nation among all degree programs for physician executives, according to the Journal's May 2006 issue. Among M.B.A. programs tailored specifically for physicians, AU's program is ranked second. Auburn University is a member of the SEC Academic Consortium, now renamed the SECU, a collaborative endeavor designed to promote research, scholarship, and achievement among the member universities in the Southeastern Conference. The SECU formed its mission to serve as a means to bolster collaborative academic endeavors of Southeastern Conference universities. Its goals include highlighting the endeavors and achievements of SEC faculty, students, and member universities and advancing the academic reputation of SEC universities. In 2013, the Auburn University participated in the SEC Symposium in Atlanta, Georgia, which was organized and led by the University of Georgia and the UGA Bioenergy Systems Research Instituteon the "Impact of the Southeast in the World's Renewable Energy Future." The Auburn campus is primarily arranged in a grid-like pattern with several distinct building groups. The northern section of the central campus (bounded by Magnolia Ave. and Thach Ave.) contains most of the College of Engineering buildings, the Lowder business building, and the older administration buildings. The middle section of the central campus (bounded by Thach Ave. and Roosevelt Dr.) contains the College of Liberal Arts (except fine arts) and the College of Education, mostly within Haley Center. The southern section of the central campus (bounded by Roosevelt Dr. and Samford Ave.) contains the most of the buildings related to the College of Science and Mathematics, as well as fine arts buildings. Several erratic building spurts, beginning in the 1950s, have resulted in some exceptions to the subject clusters as described above. Growing interaction issues between pedestrians and vehicles led to the closure of a significant portion of Thach Avenue to vehicular traffic in 2004. A similarly sized portion of Roosevelt Drive was also closed to vehicles in 2005. In an effort to make a more appealing walkway, these two sections have been converted from asphalt to concrete. The general movement towards a pedestrian only campus is ongoing, but is often limited by the requirements for emergency and maintenance vehicular access. Auburn's initial Campus Master plan was designed by Frederick Law Olmsted, Jr. in 1929. For most of the early history of Auburn, boarding houses and barracks made up most of the student housing. Even into the 1970s, boarding houses were still available in the community. It wasn't until the Great Depression that Auburn began to construct the first buildings on campus that were residence halls in the modern sense. As the university gradually shifted away from agricultural and military instruction to more of an academic institution, more and more dorms began to replace the barracks and boarding houses. In the 1980s, the City of Auburn began to experience rapid growth in the number of apartment complexes constructed. Most Auburn students today live off-campus in the apartment complexes and condos, which surround the immediate area around the university. Only 19 percent of all undergraduate students at Auburn live on campus. Auburn's on-campus student housing consists of four complexes located at various locations over campus – The Quad, The Hill, The Village, and South Donahue. The Quad is the oldest of the four housing complexes, dating to the Great Depression projects begun by the Works Progress Administration and located in Central Campus. Comprising ten buildings split into the Upper and Lower Quads, the Quad houses undergraduate students. Eight of the buildings are coed by floor, the remaining two are female-only. The Upper Quad comprises four Honors College dorms. The Hill consists of 12 buildings and is located in South Campus. The Hill houses mostly undergraduates. There are two high-rise, 6-story dormitories (Boyd and Sasnett), and all dorms are coed (but have gender-separated floors) with the exception of Leischuck and Hall M, which are female only. All of the Hill dormitories were previously used to house sororities until 2009. The sororities are now housed in the newer Village complex. The Village was constructed in 2009 and includes eight 4-story buildings to accommodate 1,700 residents. This complex houses undergraduates and sororities. South Donahue opened in 2013 and is a single residence hall located on the corner of South Donahue and West Samford, right next to the baseball stadium. These are luxury suites consisting of two bedrooms with a shared common area. Each bedroom has a double-sized bed, and each suite comes fit with a mounted flat-screen TV and its own washer and dryer units. Greek associated students make up roughly 24 percent of undergraduate men and 34 percent of women at Auburn. Male Greeks in Auburn are roughly divided into two separate areas: "Old Row" and "New Row". "Old Row" traditionally was made up of the fraternities whose houses were located along Magnolia Avenue on the north side of campus. "New Row" is made up of fraternities whose houses were located along Lem Morrison Drive southwest of campus. However, being an "Old Row" or "New Row" fraternity does not really depend on where the house is located but on the age of the fraternity. Therefore, there are some "Old Row" fraternities with houses on "New Row" Lem Morrison Drive because they moved there. Today's "Old Row" on and around Magnolia Avenue was once the "New Row", as the first generation of fraternity houses at Auburn were on or near College Street. Most of these houses were demolished by the end of the 1970s, and only the Phi Gamma Delta and Chi Phi fraternities remain. Some fraternities are not located on either "New Row" or "Old Row". There are eighteen social sororities represented at Auburn University. Sorority recruitment is a week-long process held by the Panhellenic Council in August every year. Sororities are located not in individual houses like Auburn fraternities, but in the designated dorms located in The Village. This has the unintended side effect of keeping dues for these sororities among the lowest in the nation. Each dorm has a sorority "chapter" room within it for the sorority designated to that dorm. Auburn University's sports teams are known as the Tigers, and they participate in Division I-A of the NCAA and in the Western Division of the 14-member Southeastern Conference (SEC). War Eagle is the battle cry and greeting used by the Auburn Family (students, alumni, and fans). Auburn has won a total of 19 intercollegiate national championships (including 17 NCAA Championships), which includes 2 football (1957, 2010), 8 men's swimming and diving (1997, 1999, 2003, 2004, 2005, 2006, 2007, 2009), 5 women's swimming and diving (2002, 2003, 2004, 2006, 2007), 2 equestrian (2008, 2011), and 1 women's outdoor track and field (2006) titles. Auburn has also won a total of 70 Southeastern Conference championships, including 51 men's titles and 19 women's titles. Auburn's colors of burnt orange and navy blue were chosen by Dr. George Petrie, Auburn's first football coach, based on those of his alma mater, the University of Virginia. Auburn named Gus Malzahn as the new football head coach on December 4, 2012. Other past coaches include Gene Chizik, George Petrie, John Heisman, Mike Donahue, Jack Meagher, Ralph "Shug" Jordan, Pat Dye, Terry Bowden and Tommy Tuberville. Auburn played its first game in 1892 against the University of Georgia at Piedmont Park in Atlanta starting what is currently the oldest college football rivalry in the Deep South. Auburn's first perfect season came in 1913, when the Tigers went 8-0, claiming a second SIAA conference championship and the first national championship in school history. The Tigers' first bowl appearance was in 1937 in the sixth Bacardi Bowl played in Havana, Cuba. AU football has won twelve SEC Conference Championships, and since the division of the conference in 1992, seven western division championships and four trips to the SEC Championship game. Auburn plays arch-rival Alabama each year in a game known as the Iron Bowl. In 1957, Auburn was coached by "Shug" Jordan to a 10–0 record and was awarded the AP National Championship. Ohio State University was first in the UPI coaches' poll. Auburn was ineligible for a bowl game, however, having been placed on probation by the Southeastern Conference. Three Auburn players, Pat Sullivan in 1971, Bo Jackson in 1985, and Cam Newton in 2010 have won the Heisman Trophy. The Trophy's namesake, John Heisman, coached at Auburn from 1895 until 1899. Auburn is the only school where Heisman coached (among others, Georgia Tech and Clemson) that has produced a Heisman Trophy winner. Auburn's Jordan–Hare Stadium has a capacity of 87,451 ranking as the ninth-largest on-campus stadium in the NCAA as of September 2006. Auburn went 11–0 under Terry Bowden in 1993, but was on probation and not allowed to play in the SEC Championship game. Auburn completed the 2004 football season with a 13–0 record winning the SEC championship, the school's first conference title since 1989 and the first outright title since 1987. The 2004 team was led by quarterback Jason Campbell, running backs Carnell Williams and Ronnie Brown, and cornerback Carlos Rogers, all subsequently drafted in the first round of the 2005 NFL Draft. The team's new offensive coordinator, Al Borges, led the team to use the west coast style offense which maximized the use of both star running backs. However, the Tigers were ranked behind two other undefeated teams, Southern California and Oklahoma, that played in the BCS championship game. Prior to the 2008 season, Tony Franklin was hired as offensive coordinator to put Auburn into the spread offense. He was fired, however, following the sixth game of the season that ended in a loss to Vanderbilt. Tommy Tuberville then resigned as head coach after the season. On December 13, 2008, it was reported that Gene Chizik had been hired as Auburn's new head coach. Coach Gene Chizik then hired Gus Malzahn as the Tigers' new Offensive Coordinator. In 2010, Auburn defeated Oregon 22–19 in the 2011 BCS National Championship Game to secure the school's second national championship. The Tigers finished the season with a 14–0 record, including comeback wins over Clemson, South Carolina, Georgia, and Alabama. The Tigers trailed the Tide 24–0 in Tuscaloosa, but managed a 28–27 comeback victory in the 75th edition of the Iron Bowl. Auburn would again defeat South Carolina 56–17 in the 2010 SEC Championship Game, claiming the school's eleventh conference championship. The Tigers were led by head coach Gene Chizik, offensive coordinator Gus Malzahn, quarterback and Heisman Trophy winner Cam Newton, and defensive tackle and Lombardi Award winner Nick Fairley. In Malzahn's first season as head coach (2013), Auburn had two miraculous finishes in the final minute against Georgia and Alabama to win the SEC West. They went on to win the 2013 SEC Championship Game over Missouri and fell short in the 2014 BCS National Championship Game to the Florida State Seminoles 34-31 in Pasadena, California. In addition to the 1913, 1957, and 2010 championships, Auburn's 1914, 1958, 1983, 1993, and 2004 teams have also been recognized as national champions by various ranking organizations. In the last decade under head coaches David Marsh, Richard Quick and co-head coach Brett Hawke, Auburn's swimming and diving program has become preeminent in the SEC and nationally, with consecutive NCAA championships for both the men and women in 2003 and 2004, then again in 2006 and 2007. Since 1982, only 8 teams have claimed national championships in women's swimming and diving. Auburn and Georgia each won nine straight(five Auburn, four Georgia) between 1999 and 2007. The men won their fifth consecutive national title in 2007, and the women also won the national title, in their case for the second straight year. The Auburn women have now won five national championships in the last six years. As of 2009, the Auburn men have won the SEC Championship fifteen out of the last sixteen years, including the last thirteen in a row, and also won eight NCAA national championships (1997, 1999, 2003, 2004, 2005, 2006, 2007 and 2009). AU swimmers have represented the U.S. and several other countries in recent Olympic Games. Auburn's most famous swimmer is Olympic gold medalist Rowdy Gaines, and also Brazilian César Cielo Filho, bronze(100m freestyle) and gold medal(50m freestyle) at the 2008 Beijing Olympic Games. As the most successful female Olympic swimmer Kirsty Coventry (swimming for her home country of Zimbabwe) who won gold, silver, and bronze medals at the 2004 Summer Olympics in Athens. While the football team is far more well-known nationally and in the media, Auburn swimming and diving is the most dominant athletics program for the university. The Auburn men's basketball team has enjoyed off-and-on success over the years. Its best known player is Charles Barkley. Other NBA players from Auburn are John Mengelt, Rex Fredicks, Eddie Johnson, Mike Mitchell, Chuck Person, Chris Morris, Wesley Person, Chris Porter, Mamadou N'diaye, Jamison Brewer, Moochie Norris, Marquis Daniels, and Pat Burke. The Auburn University women's basketball team has been consistently competitive both nationally and within the SEC. Despite playing in the same conference as perennial powerhouse Tennessee and other competitive programs such as LSU, Georgia, and Vanderbilt, Auburn has won four regular season SEC championships and four SEC Tournament championships. AU has made sixteen appearances in the NCAA women's basketball tournament and only once, in their first appearance in 1982, have the Tigers lost in the first round. Auburn played in three consecutive National Championship games from 1988–1990 and won the WNIT in 2004. When Coach Joe Ciampi retired at the end of the 2003–2004 season, Auburn hired former Purdue and U.S. National and Olympic team head coach, Nell Fortner. Standout former Auburn players include: Ruthie Bolton, Vickie Orr, Carolyn Jones, Chantel Tremitiere, Monique Morehouse, and DeWanna Bonner. Auburn Baseball has won six SEC championships, three SEC Tournament championships, appeared in sixteen NCAA Regionals and reached the College World Series (CWS) four times. After a disappointing 2003–2004 season, former Auburn assistant coach Tom Slater was named head coach. He was replaced in 2008 by John Pawlowski. Samford Stadium-Hitchcock Field at Plainsman Park is considered one of the finest facilities in college baseball and has a seating capacity of 4,096, not including lawn areas. In addition to Bo Jackson, Auburn has supplied several other players to Major League Baseball, including Frank Thomas, Gregg Olson, Scott Sullivan, Tim Hudson, Mark Bellhorn, Jack Baker, Terry Leach, Josh Hancock, Gabe Gross, Steven Register, and Josh Donaldson. Auburn's Women's Golf team has risen to be extremely competitive in the NCAA in recent years. Since 1999, they hold an 854–167–13 (.826 win percentage) record. The team has been in five NCAA finals and finished second in 2002 and then third in 2005. The program has a total of seven SEC Championships (1989, 1996, 2000, 2003, 2005, 2006, and 2009). The seven titles is third all time for Women's golf. In October 2005, Auburn was named the #3 team nationally out of 229 total teams since 1999 by GolfWeek magazine. Auburn's highest finish in the NCAA tournament was a tie for 2nd in 2002. Since 1996, the team has been headed by Coach Kim Evans, a 1981 alumna, who has turned the program into one of the most competitive in the nation. Coach Evans has helped develop All-Americans, SEC Players of the Year as well as three SEC Freshman of the Year. She has led the Tigers to eight-straight NCAA appearances. She is by far the winningest Coach in Auburn Golf History, having over 1100 wins and winning six of Auburn's seven total SEC Titles. Evans was named National Coach of the Year in 2003 and has coached 8 individual All-Americans while at Auburn. The Auburn women's track and field team won its first ever national title in 2006 at the NCAA Outdoor Track and Field Championships, scoring 57 points to win over the University of Southern California, which finished second with 38.5 points. Auburn posted All-American performances in nine events, including two individual national champions and three second-place finishers, and broke two school records during the four-day event. Auburn's men's team finished second at the 2003 NCAA Outdoor Championships and at the 1978, 1997 and 2003 NCAA Indoor Championships. The women's team finished 14th (2002, 2003) at the Outdoor Championships and seventh (2003) at the Indoor Championships. Auburn's Equestrian team captured the 2006 national championship, the first equestrian national championship in school history. Senior Kelly Gottfried and junior Whitney Kimble posted team-high scores in their respective divisions as the Auburn equestrian team clinched the overall national championship at the 2006 Varsity Equestrian Championships at the EXPO/New Mexico State Fairgrounds in Albuquerque, NM. In 2008, the Auburn Equestrian team captured the 2008 Hunt Seat National Championship. Over fences riders finished 12–1–1 overall for the week. Auburn has also consistently been highly ranked in the Women's Intercollegiate Equestrian National Coaches Poll as well. The Auburn Equestrian team most recently captured the 2016 national championship. Notable among a number of songs commonly played and sung at various events such as commencement and convocation, and athletic games is War Eagle the Auburn University fight song. Auburn University has many traditions including a creed, an alma mater, a fight song, a battle cry, a mascot, and several notable game-day traditions including an eagle flying over the football field. Navy Blue , PMS (289), RGB (3,36,77). In the 1950s and 60s Auburn designated a day on campus called "Hey Day" that encouraged students to interact with each other and simply say "hey." Auburn reinstated this tradition in 1985 and has continued to evolve until this day. On Hey Days now, students are asked to put on name tags, handed out by student body leaders, and encouraged to say "hey" to whomever may pass them by during the day. Auburn has currently three eagles in their flight program for educational initiatives. One of these educational programs is known as the pregame flight program where the eagle handlers set an eagle free before Auburn takes the field at Jordan Hare Stadium. The eagle then proceeds to fly around the stadium and eventually land in the middle of the field. Tiger, Auburn's first eagle, was born in 1980 in captivity and given to Auburn University in 1986 . Tiger's first flight before an Auburn Football game came against Wyoming in 2000. She retired after the Georgia game in 2006. Throughout Tiger's career, she flew many different flights and at many different venues including the 2002 Winter Olympics. Auburn's second Flight program eagle is Nova. Her first flight came before Auburn's game against Kentucky in 2004. She was born at the Montgomery zoo and given to Auburn a year later. Spirit is the only Bald Eagle Auburn has used for its pregame flight program. His first flight was in 2000. Spirit was found as a baby with an injured beak and nursed back to health before being given to Auburn for further rehabilitation in 1998 . Unfortunately, Spirit's beak was damaged to the point that it is impossible for his release back into the wild. 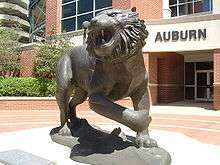 Auburns mascot, Aubie the tiger has been around since 1959. He made his first appearance that year on the Oct 3 gameday football program versus Hardin-Simmons College. Aubie was the creation of Birmingham Post-Herald artist Phil Neel and was the focal point of Auburn's football programs for 18 years. Auburn Football Experienced good luck while Aubie remained on the cover ending with a 23-2-1 home record and 63-16-2 overall record while he was on the football cover. Aubie the tiger is still currently Auburn's official mascot and has won the most National Mascot titles in the contest's history, with eight. Auburn's Tiger Walk began in the 1960s, after fans would try to stop the players and get autographs before the games. It has since evolved into the spectacle, where fans line Donahue Drive to cheer on the team as they make their way from the athletic complex to the field. The highest point of the tiger walk came in 1989, when Auburn and Alabama played each other for the first time away from Legion Field in Birmingham. It is estimated that around 20,000 Auburn fans came out and lined the street to cheer on the team that day. During Auburn's game against Georgia in 1892, a civil war veteran in the stands brought his pet eagle that he found on a battleground during the war. The eagle during the game flew away from the soldier and began circling the field in the air. As all this went on, Auburn began marching down the field to eventually score the game winning touchdown. At the end of the game, the eagle dove into the ground and subsequently died; however, the Auburn faithful took the eagle as an omen of success and coined the phrase "WAR EAGLE" in turn. During a game against the Carlisle Indian Team in 1914, Auburn attempted to single out Carlisle's toughest player, Bald Eagle. To tire him out, they began running the ball his way during every play, by saying "bald eagle", while in formation. The crowd mistook this and began yelling "War Eagle", instead, leading to Auburn's player, Lucy Hairston, to yell "War Eagle: at the end of the game, after he scored the game-winning touchdown. During a pep rally in 1913, a cheerleader said that the team would have to fight the whole game because the game meant "war." At the same time of the rally, an eagle emblem fell on a student's military hat. When asked what it was, he yelled it was a "War Eagle". After a battle, the Saxon warriors would yell "War Eagle", when the buzzards started to circle the battlefields. Some believe that Auburn coined its battle cry from this practice by the Saxons. The tradition of rolling Toomer's Corner on Auburn's campus after home and big away victories is thought to have originated in the 1950s. 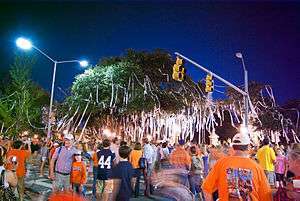 The tradition is thought to have spawned from when the owner of Toomer's Drugs, Sheldon Toomer, would toss his receipt paper into the trees to signal an Auburn road victory. The Auburn Plainsman – the university's student-run newspaper, has won 23 National Pacemaker Awards from the Associated Collegiate Press since 1966. Only the University of Texas' student paper has won more. WEGL 91.1 FM – The Auburn campus radio station which is open to students of all majors as well as faculty and staff who wish to DJ. Eagle Eye TV – Auburn University's on-campus news station that is run by students and that airs on-campus, off-campus, and on-demand via eagleeyetv.com. The Auburn Circle – The student general-interest magazine. The Circle publishes poetry, art, photography, fiction, nonfiction, and architectural and industrial design from Auburn students, faculty, staff, and alumni. Glomerata – Auburn University's student-run yearbook which began production in 1897. Its name is derived from the conglomeration of Auburn. Southern Humanities Review – One of the leading literary journals in the region, The Southern Humanities Review has been published at the university by members of the English faculty, graduate students in English, and the Southern Humanities Council since 1967, publishing the work of nationally known authors such as Kent Nelson and R. T. Smith. Encyclopedia of Alabama - Auburn hosts the encyclopedia's editorial offices and servers and the Alabama Humanities Foundation holds copyright to the encyclopedia's original content. Auburn University Office of Communications and Marketing – Auburn University's news outlet for media related to the accomplishments of university faculty, staff and students. Auburn University's official YouTube channel – Auburn University's YouTube channel was announced on January 15, 2008. It contains a wide variety of videos, from promotional to educational. AU's Office of Communications and Marketing manages the content on the university's YouTube Channel. Auburn University Student Space Program (AUSSP) – The AUSSP is a student-led, faculty-mentored program to design, build, launch, and operate spacecraft. Participants launch high-altitude balloons to the edge of space to test engineering and science instruments, they build small satellites that orbit Earth, and they are working with other universities on missions to the moon and Mars. The AUSSP is made of three groups: the Auburn High Altitude Balloon (AHAB) group, the AubieSat-1  (Small Satellite) group, and the management group – involving students who are not majoring in the sciences or engineering. Many students take Directed Reading in Physics (PHYS 4930) and get credit for participating in AUSSP. United Nations World Food Programme (WFP) – Auburn University is the WFP's lead academic partner in a recently launched student "War on Hunger" campaign. In 2004, the WFP tasked Auburn University with heading the first student-led War on Hunger effort. Auburn then founded the Committee of 19 which has led campus and community hunger awareness events and developed a War on Hunger model for use on campuses across the country. The Committee of 19 recently hosted a War on Hunger Summit at which representatives from 29 universities were in attendance. Cooperative Education (Co-Op) – Co-Op at Auburn University is a planned and supervised program alternating semesters of full-time college classroom instruction with semesters of full-time paid work assignments. These work assignments are closely related to the student's academic program. Thousands of Auburn University graduates, especially engineering majors, have supported themselves financially while studying at Auburn by participating in Co-op. This educational program prepares students for professional careers by combining academic training with practical work experience in industry, business, and government. The Sol of Auburn – Auburn University's Solar Car Team – recently participated in the North American Solar Challenge 2005. On July 27, 2005, Auburn's car crossed the finish line in Calgary, Alberta, Canada in 4th place in Stock Class, 12th Place overall. The SOL of Auburn is the only solar car in Alabama, and the project is organized by Auburn University's College of Engineering with a team of four faculty and over twenty undergraduate students. The War Eagle Flying Team (WEFT) – A student organization made up of both pilots and non-pilots. Most team members are Professional Flight Management, Aviation Management, or Aerospace Engineering majors. WEFT competes with other flying teams at the annual National Intercollegiate Flying Association (NIFA) sponsored Safety and Flight Evaluation Conference (SAFECON). Auburn University Computer Gaming Club – One of the oldest University Sponsored Computer Gaming Clubs in the U.S. Weekly meetings and semesterly LAN parties. Samford Hall Clock Tower – Information on the Samford Hall Clock Tower, a well known symbol of Auburn University. Also includes information on the bell and carillon. Over 200 including Apple CEO Tim Cook and Wikipedia co-founder Jimmy Wales. ↑ As of June 30, 2015. "U.S. and Canadian Institutions Listed by Fiscal Year (FY) 2015 Endowment Market Value and Change in Endowment Market Value from FY 2014 to FY 2015" (PDF). National Association of College and University Business Officers and Commonfund Institute. 2015. ↑ "Gogue Named 18th President of Auburn University". Communications and Marketing, Auburn University. 2007-03-22. Archived from the original on 17 October 2007. ↑ "Office of the Executive Vice-President". Auburn University. Retrieved 6 September 2014. ↑ "About Provost Timothy Boosinger". Auburn University. Retrieved 6 September 2014. ↑ "Distribution of Employees by Major Unit Fall 2015". Auburn University. Retrieved 5 November 2015. ↑ "ENROLLMENT BY GENDER AND LEVEL, COLLEGE/SCHOOL FALL 2016". Auburn University. Retrieved 28 October 2016. 1 2 "ENROLLMENT BY GENDER AND LEVEL, COLLEGE/SCHOOL FALL 2016". Auburn University. Retrieved 28 October 2016. ↑ "Quick Facts About AU". Auburn University. 2007. Archived from the original on 7 August 2007. Retrieved 2012-08-20. 1 2 "Auburn University Official Colors and Usage". Retrieved 2012-10-13. 1 2 "Auburn University Official Colors". Retrieved 2012-10-13. ↑ "Auburn University". Alabama Department of Finance. Retrieved 2007-03-24. ↑ "Standard & Poor: Flagship Universities Remain Among The Strongest In The U.S. Public Higher-Education Sector, Report Says" (PDF). Standard & Poor. Retrieved 23 July 2010. ↑ "Standing Out From the Crowd". The Chroncle of Higher Education. Retrieved 15 March 2012. ↑ "USA Today Tuition Survey". USA Today. Retrieved 30 August 2006. 1 2 "About Auburn" (URL). Auburn University. Archived from the original on 24 October 2008. Retrieved 2008-11-13. ↑ "Auburn University's first black student: 'Happened to be at the right place at the right time'". AL.com, June 10, 2013. ↑ Anson West, History of Methodism in Alabama (Nashville: Methodist Episcopal Church South, 1893), 738–739. ↑ "The Cannon Lathe plaque". Retrieved 2011-01-17. 1 2 Price, Juan (2014-01-21). "Auburn commemorates 50 years of integration with public forum". The Plainsman. ↑ "Total Enrollment by Gender and Ethnicity". Auburn University Office of Institutional Research and Assessment. 2013-10-16. ↑ "Full-Time Employees by Type and Race & Ethnicity". Auburn University Office of Institutional Research and Assessment. 2012-12-19. ↑ "U.S. News ranks Auburn among Top 50 public universities for 15th consecutive year". Wire Eagle at Auburn University. 2007-08-17. Archived from the original on 24 August 2007. Retrieved 2007-08-22. ↑ "Auburn University". Retrieved 29 May 2015. ↑ "Auburn Top-Ranked State School In National Magazine Survey". U.S. News and World Report. ↑ "Best Business Schools". America's Best Graduate Schools. U.S. News & World Report. 2010. Archived from the original on 20 April 2010. Retrieved 2010-04-17. ↑ "Best Education Programs". America's Best Graduate Schools. U.S. News & World Report. 2010. Archived from the original on 15 April 2010. Retrieved 2010-04-17. ↑ "Best Engineering Schools". America's Best Graduate Schools. U.S. News & World Report. 2010. Archived from the original on 13 April 2010. Retrieved 2010-04-17. ↑ "Best Medical Schools: Primary Care Rankings". America's Best Graduate Schools. U.S. News & World Report. 2010. Archived from the original on 21 April 2010. Retrieved 2010-04-17. ↑ "Best Graduate Schools: Pharmacy". America's Best Graduate Schools. U.S. News & World Report. 2008. Archived from the original on 7 April 2010. Retrieved 2010-04-17. 1 2 3 4 5 6 7 "Public Affairs Rankings". U.S. News & World Report. 2008. Retrieved 2010-04-17. ↑ "Rehabilitation Counseling Ratings". U.S. News & World Report. 2008. Retrieved 2010-04-17. ↑ "Top Public Schools: National Universities". America's Best Colleges 2011. U.S. News & World Report, 2010. Retrieved: October 25, 2010. ↑ Peterson, Thompson. "Auburn University Overview". Archived from the original on 2006-08-31. Retrieved 2006-09-26. ↑ Jackson, Kristen (2006). "AU launches largest-ever fundraising campaign". Auburn University Office of Communications and Marketing. Archived from the original on 20 August 2006. Retrieved 2006-08-13. ↑ "Frequently Asked Questions". Mises.org – Mises Institute. Retrieved 2010-12-29. ↑ "Office of Institutional Research and Assessment". Retrieved 29 May 2015. ↑ "Office of Institutional Research". web.auburn.edu. Retrieved 2015-12-28. 1 2 Caddell, Sallie (March–April 2008). "Auburn University Aviation". AutoPILOT magazine. Archived from the original on December 23, 2008. Retrieved 2008-06-03. ↑ Auburn University Campus Map – http://oitapps.auburn.edu/campusmap/ click on each building for more information. ↑ "Auburn University". Collegeboard. Retrieved 29 December 2013. ↑ "Quickfacts". U.S. Census. Archived from the original on April 21, 2008. Retrieved 29 December 2013. ↑ Kensler, Mike (April 20, 2014). "Director's Corner: Nature and the Environmental Movement: Human Values in Action". Auburn University Office of Sustainability. ↑ "College Search". 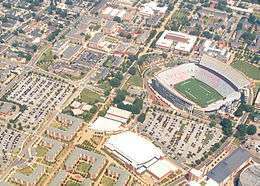 Auburn University – Housing & Campus Life. Retrieved 2010-12-29. ↑ "Board approves tuition increase, new residence halls". The Auburn Plainsman. Retrieved 2007-04-29. ↑ "Auburn hires Gene Chizik as football coach". Sporting News. 2008-12-13. Archived from the original on 16 December 2008. Retrieved 2008-12-13. ↑ College Football Data Warehouse, Yearly National Championship Selectors, 1913, 1914, 1958, 1983, 1993, 2004. Retrieved July 28, 2008. ↑ "Auburn Men's Swimming and Diving Makes it Four-in-a-Row, Complete Sweep of 2006 NCAA Swimming and Diving Titles". Auburn University and CSTV Networks, Inc. 2006-03-15. Retrieved 2007-09-10. ↑ "No. 6 Women's Golf Rallies In Final Round To Win SEC Championship". Auburn University. Retrieved 2009-05-30. ↑ "Auburn Women's Golf named No. 3 Program since 1999". Auburn University. Retrieved 2009-05-30. 1 2 3 4 5 6 7 "AuburnTigers.com - Official Athletics Site of the Auburn Tigers - Traditions". Retrieved 29 May 2015. 1 2 "Auburn football - Auburn Tigers Football NCAA News from al.com". al.com. Retrieved 29 May 2015. ↑ BR Studios. "Behind the Auburn Tradition of Rolling Toomer's Corner". Bleacher Report. Retrieved 29 May 2015. ↑ "Auburn university news". Auburn university news. 2002-11-08. Archived from the original on 11 October 2008. Retrieved 2008-11-18. ↑ "AU launches Youtube channel". Auburn university news. 2008-01-15. Archived from the original on 15 October 2008. Retrieved 2008-11-18. ↑ "AubieSat-1". Space.auburn.edu. Retrieved 2010-12-29. Wikimedia Commons has media related to Auburn University. "Alabama Polytechnic Institute". Collier's New Encyclopedia. 1921.